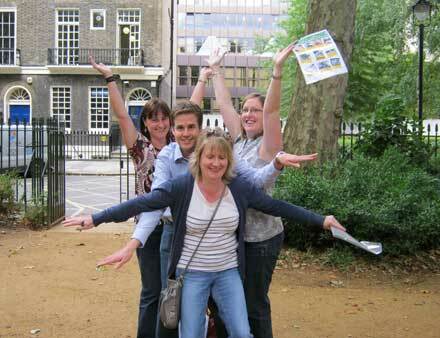 ﻿ The Bloomsbury London Treasure Hunt. WHO'S AFRAID OF READING VIRGINIA WOOLF? The Bloomsbury Group - a collection of writers, artists, designers and an economist - dominated the literary scene in the first half of the 20th century and boy did they know how to party! The group consisted of such luminaries as Virginia Woolf, E. M Forster, Bertrand Russell, John Maynard Keynes, Lytton Strachey and Clive and Vanessa Bell. It was famously said of them that they "lived in squares, moved in circles and loved in triangles", or, as Gertrude Stein put it, they were like the "Young Men's Christian Association - with Christ left out!" LOATHING IN SQUARES MORE LIKE! Plaques and memorials to them are generously dotted around the London neighbourhood with which they were so indelibly linked, and these make the perfect material with which to thread together a deliciously deceptive Bloomsbury treasure hunt that might just leave you loathing in squares and going round in circles! Seriously though, this is a lovely treasure hunt that is crammed with facts and information and which offers a huge amount of variety, both in the locations it visits and in the famous figures it encounters. In the course of the Bloomsbury Treasure Hunt you will pick your way through graceful squares, hidden courtyards and leafy backwaters. In addition to the aforementioned members of the Bloomsbury Group, you will also cross paths with - to name but a few - the likes of Charles Dickens, a Green Man, Francis Russell (who he? ), T. S. Eliot, a Roman Emperor, The Pankhurst sisters, George 111, Christina Rossetti and Captain Thomas Coram. 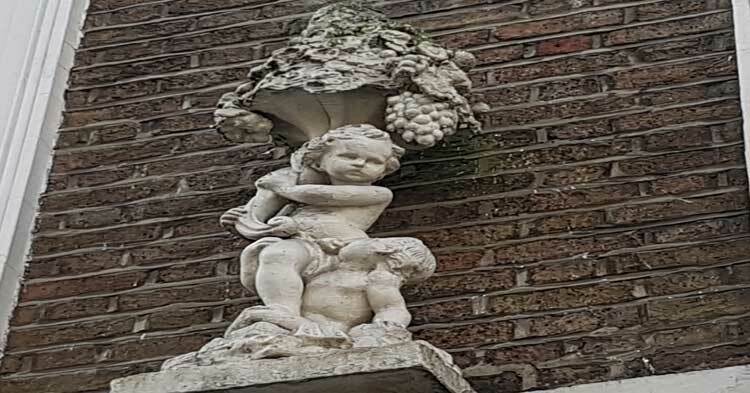 You'll be positively inspired by the eclectic mix of glorious buildings and former publishing houses that you will encounter as you follow the cunning clues that will help you to pick your way around the Bloomsbury Treasure Hunt Route. As you do so, you will also need to keep keen eyes peeled for the solutions to the Observation Questions and Photo Challenges that you will be given. At first glance they might seem nigh on impossible to answer (at least some of them might). But don't worry, because the solutions are there, scattered around the streets of Bloomsbury, you've just got to find them. They might be on blue plaques, on information boards, on the plinths of statues or even on the (exterior) walls of pubs. One of the solutions is even located in the ...... now that would be telling! The soaring splendour of the building upon which George Orwell based the Ministry of Truth in 1984. It is also one of Ricky Gervais's favourite London buildings, but that's another story. A lovely playground where, in a nice reversal of the norm, adults are not allowed to enter unless they are accompanied by a child! The sweeps church which remembers a harsher, bygone age when young children were sent up London's chimneys to clean them. An old mews that dates from the days when London was a horse powered city and where an 19th century sign can still just about be read on one of the walls by those who look hard enough. The larder where food was kept to sate the appetite of King George 111 when his attempts to solve some of the fiendish clues on our Bloomsbury Treasure Hunt brought on a bout of insanity! WE DIDN'T REALLY SEND HIM MAD! Okay, we made that last bit up, his insanity was nothing to do with us and anyway the clues will intrigue and fascinate you, rather than drive you mad. Curious pieces of street furniture and even more curious statues are incorporated into this carefully paced jaunt through a quarter of London that not too many people take the time to become acquainted with. What is certain though is that once you have scratched the surface and taken a peek at this neighbourhood you will want to return in order to get to know it a little better. So, whether you are looking for a team building activity, an evening event that will get yourself, your friends and work colleagues out and about, or even an enjoyable Saturday morning or lazy Sunday afternoon social gathering, hen party or birthday party, why not join some of the greatest writers of English literature on a journey through a neighbourhood that is both magical and intriguing? 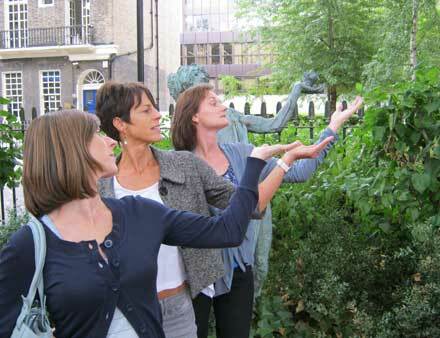 The cost of the Self Managed Bloomsbury Treasure Hunt Package is £140.00 for 4 packs.